An exhibit exploring African American contributions to the nation's maritime history opens at the Independence Seaport Museum in Philadelphia. "Black Hands, Blue Seas: The Untold Maritime Stories of African Americans" features art, artifacts and documents, chronicling the origins of black maritime tradition which begins with boat-building traditions in Africa. 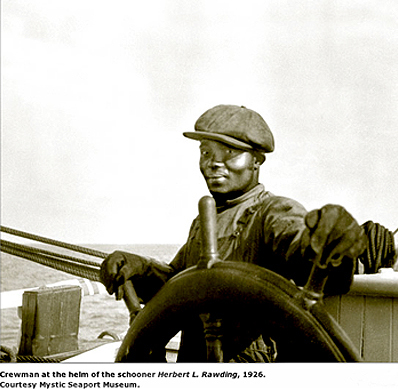 The exhibit sheds light on the often overlooked roles that African Americans played as fishermen, stevedores, merchant mariners, Coast Guard lifesavers, sailors and captains. A few interesting facts learned at the exhibit: the abolitionist and author Frederick Douglass escaped slavery disguised as a sailor; wealthy captain and ship owner Paul Cuffee sponsored voyages taking freed slaves back to Africa; and escaped slave William B. Gould served in the U.S. Navy during the Civil War. The exhibit originated in Connecticut's Mystic Harbor and will be in Philadelphia for a year before traveling to the next port.